Curry leaves are a rich source of iron and folic acid. Folic acid is essential for the iron absorption in body. So continuous intake of curry leaves beats anemia. It protects your liver from damage due to the high level of antioxidants it possesses. It maintains the blood sugar level. Improves digestion. Protects from heart diseases due to the high level of antioxidants. The alkaloid carbazole present in curry leave, possesses anti bacterial and anti inflammatory properties helps stop diarrhoea. Relieves the symptoms of cold and cough. Treats and prevents skin infections.Accelerates hair growth. The health benefits of curry leaves are endless. I have shared some curry leaves recipes earlier in my blog. 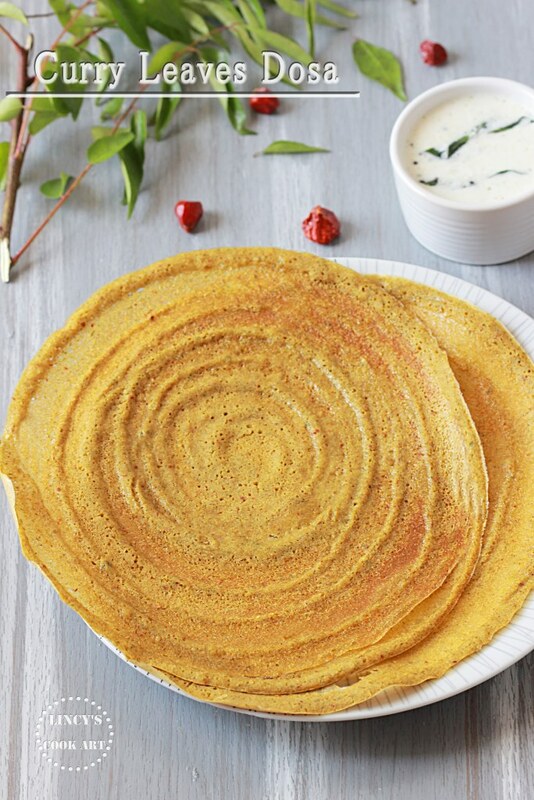 Today I have come up with a tasty flavourful dosa recipe with curry leaves. Dosa batter- 6-8 ladle (or) Rice- 1 cup soaked for 3 hours to make Instant dosa. You could follow the recipe if you have dosa batter with you. You could grind while making dosa batter and ferment the batter too. Or else follow the Instant dosa making procedure and add this ingredients while grinding and make this yummy dosas. In a blender jar add the curry leaves, dry red chillies, jeera, garlic, asafetida and turmeric powder. Grind to crush the leaves then add some water and a spoon of dosa batter (to grind well and to avoid watery batter); grind to make a thick paste.You could grind only curry leaves and prepare the same dosa. Take the curry leaves paste in a bowl and and add in the dosa batter. Stir well and add salt if required. Heat a dosa tawa and grease with oil; take a ladle full of batter and spread as concentric circles. Drizzle oil on top of the dosa and cook till crispy. You could cover with a lid and cook the top if needed. Turn the other side and cook if required. I have not done that as I have made as thin dosas.